This is a beautiful demo of Spherical Environment Mapping (MatCap/LitSphere) and Normal Mapping created by Jaume Sánchez @thespite. 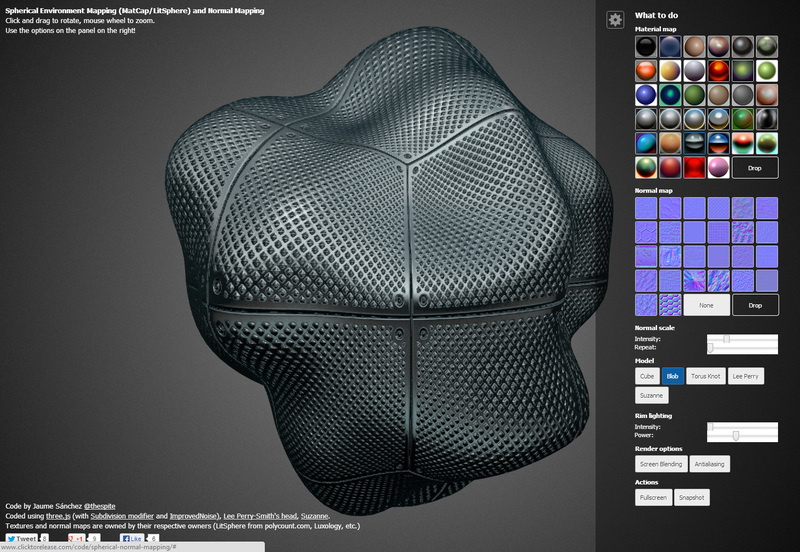 Select from a variety of object shapes, textures and normal maps from the slide-out panel on the right and adjust the intensity and other effects. The results are stunning, from objects that seemingly look like hot lava rocks, to reflective metal cheese graters, just by tweaking a couple of parameters. You can even drop your own textures onto the objects. Needless to say a WebGL capable browser/computer is required, but I certainly had great fun producing images like this. Play with Spherical Normal Mapping. This entry was posted in WebGL and tagged 3D, environment maps by Richard Davey. (permalink). on Posted on October 15, 2013 by Richard Davey.